information:- THE "LION'S" MOTTO. - H.M.S. "LION," LAUNCHED 1910, COMPLETED 1912. 26,350 TONS. THE FLAGSHIP OF ADMIRAL BEATTY IN THE VICTORIES OF HELIGOLAND BIGHT AND THE DOGGER BANK. SPEED, 28 KNOTS PER HOUR. ARMAMENT. 8 13.5 -INCH GUNS; 16 4 -INCH; 2 TORPEDO TUBES. 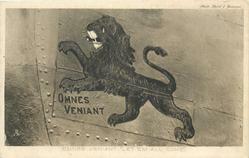 WHEN THIS BATTLESHIP WAS LAUNCHED THE DEVICE ON THIS CARD WAS PAINTED ON HER BOWS, A RAMPANT LION, WITH THE LATIN MOTTO WHICH IS A DIGNIFIED FORM OF THE COLLOQUIAL CHALLANGE - "LET 'EM ALL COME!"